This past Saturday October 11th, the CEID filled with people from all corners of campus to address problems in healthcare and global health. The CEID was the second venue for Hacking Health @ Yale, which began at the Yale School of Medicine and finished at the Yale School of Management. Organized by Yale’s Center for Biomedical Interventional Technology (CBIT), InnovateHealth Yale (IHY), and the Biomedical Innovation Student Club, with help from the CEID and MIT Hacking Medicine, the event focused on innovation and entrepreneurship within the space of healthcare. Participants were encouraged to come with ideas of problems to address and pitched them at the event kickoff on Friday. Soon these problems morphed into potential opportunities for innovation related to medical devices, patient care, and more. The group broke off into smaller teams, each tasked with innovating in a particular healthcare space and developing a solution to a problem in this space in just one weekend. The teams took to the white board and ideated. From the post-it notes and post-it notes of crazy ideas, each group selected a concept and began fleshing it out, researching, and prototyping. 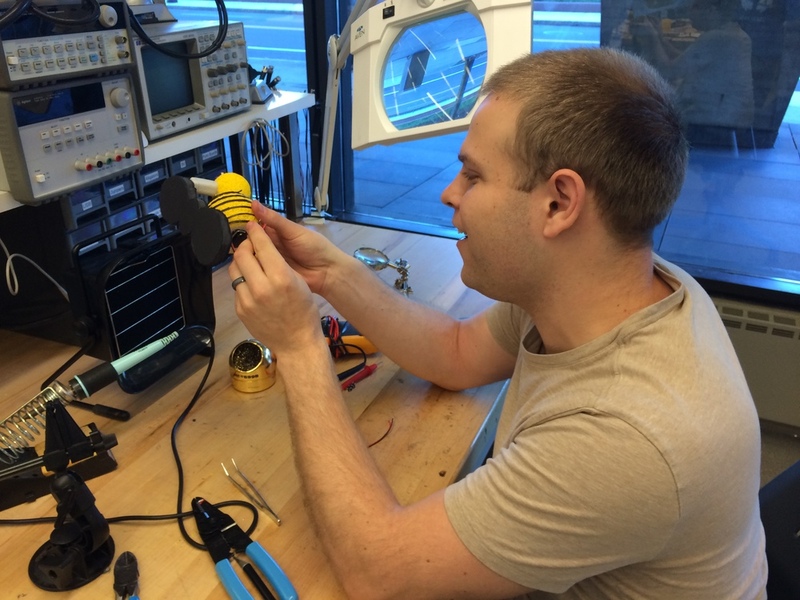 If you happened to wander over to the electronics bench on Saturday, you would have found Matt Reagor, a graduate student in applied physics, working away on what looked like a bumblebee. This bee was his team’s healthcare hack. “Getting diagnosed with Type I diabetes as a four year old is a really scary thing,” Matt explained. “It means getting a lot of needles and poking all at once into your life.” To make the experience “a little less scary and a little more fun,” the team turned a blood sugar testing device and needle into a friendly bumblebee. Their prototype involved simple Styrofoam balls with yellow and black paint. To make the bee even friendlier, Matt incorporated some simple circuits to make the wings spin when the blood is tested. They even added on a little buzzer to remind the patient to check their blood sugar levels. Over the course of the weekend, the team went from a broad problem to a functioning prototype! This project is just one example of a simple and fun solution to a widespread problem. Another team worked on an antiseptic feeding tube, and yet another designed a system for getting a second opinion on cancer diagnoses. The event culminated in a presentation on Sunday at which the teams shared their final developed concepts and prototypes. Look out for future exciting opportunities to innovate and problem solve through the weekly CEID emails.